In giving voice to many voices, the translator offers different worlds from distinct writers to different worlds of readers, and so triggering the imagination and curiosity of those who embark on their works. By naturally bringing cultures and mentalities together, the translation promotes the presentation and representation of authors who deserve to be eternalized. Hence, building bridges in a reality where isolationism is on the rise, worldwide, translation goes beyond a craft and turns to be a beautiful mission. The power of the translation and its challenges and peculiarities were the theme of a discussion at FLIP this year at the table "The translation in Brazil - transcending borders" at the Silo Cultural Institute, which honored this year the award-winning Brazilian writer and translator Ruth Guimarães, deceased In 2014. Ruth occupied the 22nd chair of the São Paulo Academy of Letters and was a profound connoisseur of our popular culture, succeeding in distinguishing herself nationally. Joaquim Maria Botelho, son of this admired prose writer and former president of the Brazilian Union of Writers, spoke on the matter of translation in Brazil. He thanked the participants and emphasized the works produced by his mother that translated into French, Greek and Latin. Thereafter, Alicia Meier, translator and coordinator of the ‘Word for Word’ program at Columbia University, and Roberto Taddei, author and director of the Vera Cruz Institute's Creative Writing Program, opened the debate about the importance of knowing the intentions of the author and the need for translators to be good writers in order to produce quality works. According to Alicia, the contact with writers from different cultures has become an important element of what School of the Arts (SOA) offers to its students in the Writing program. “The idea that drove the program was that the act of translation can expand a writer´s lingusitic imagination”, she affirmed. As for Taddei, the novelist stressed that the translation goes beyond word substitution. "It's not just about ‘passing a text into another language’, since we are also dealing with another dimension: it is what happens when writers from different cultures meet and begin to dialogue to translate their texts", he said. The event was also an opportunity to launch the book ‘Word for Word’, project of texts translations of the Columbia School of the Arts and the Institute Vera Cruz´s students, and it was very well received. Two of these students (one Brazilian and one American) illustrated how such an experience was for them. Jared Leong of Columbia and Caroline Freire of the Vera Cruz Institute translated each other documents and shared their learning and challenges with the audience. For Jared, participating in this program was like getting a Lego house finished and having to rebuild it differently, but in a way that the bricks fit. Caroline, however, pointed out that the greatest difficulty lies precisely in how to achieve such a reconstruction without missing the author's style, for in the case of Jared's work, for example, she had to adapt to the musicality of his narrative and to become more engaged with Pop culture as the American was. Columbia School of the Arts began seeking institutions in Latin America for partners in the program three years ago and since then has been embracing progressively an international community standing, where peers have the opportunity to learn from one another's diverse cultures and backgrounds within their own classrooms. 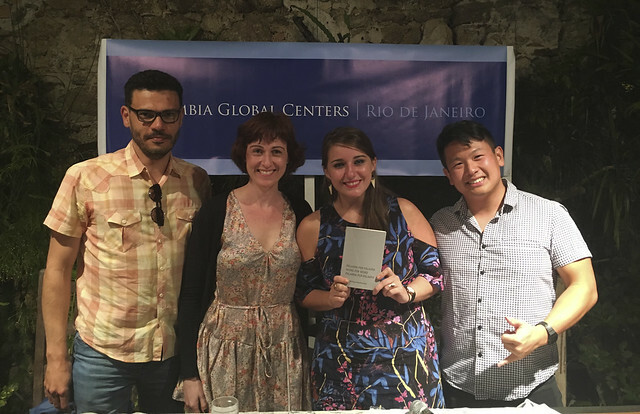 The Columbia Global Centers | Rio de Janeiro develops projects in Brazil in partnership with the Columbia School of the Arts in order to explore arts and culture locally and globally, promoting themes such as cinema, creative writing and screenwriting. The Global Center has been present at FLIP since 2014.